Spacious and bright, 1 bed/ 1 bath updated CORNER UNIT in The Pavilion. Quietly located at the back of the building overlooking Bankview & Downtown. Large kitchen features an over-sized island & breakfast bar, corner pantry, BRAND NEW dishwasher & tiled back splash. The Great Room plan is open-concept, surrounded by windows & offers access to private balcony. Beautifully updated with BRAND NEW carpet, light fixtures, kitchen back splash & textured ceiling. Full size HE front loading IN-SUITE LAUNDRY. 15' x 11' Master bedroom easily fits a king bed & features a WALK-IN CLOSET with custom organizer. 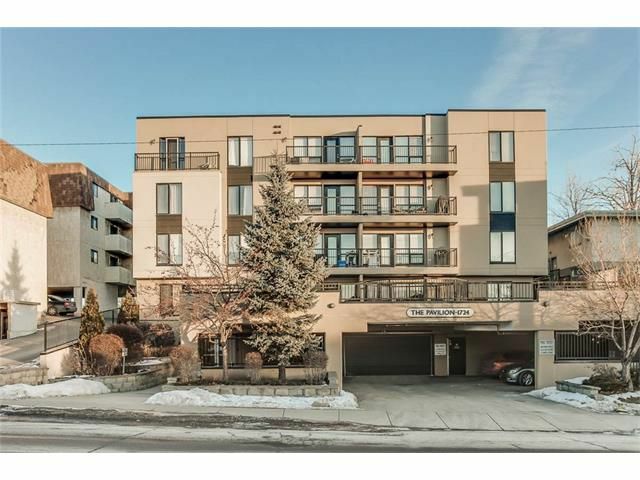 This complex has everything you need; INDOOR HEATED PARKING, secure building, intercom, ELEVATOR & outdoor VISITOR PARKING. LOW CONDO FEES include all utilities except electricity. 3 blocks from Starbucks & 14th St Market. Close to River Park, shops & restaurants of Marda Loop, 17th Ave & Downtown. Car to Go Zone. Shows 10/10!